The Aynalıkavak Kasır was one of the oldest summer palaces on the shore of the Golden Horn in Istanbul. This palace is located behind the Golden Horn Dockyard (Haliç Tersanesi). The palace was built in 1613 during the reign of Sultan Ahmet I (1603-1617). He stayed frequently in this palace, and his youngest son, the future Sultan Ibrahim (1640-1648) was born here. The palace was burn out in 1678 and rebuilt in the period of Sultan Mehmed IV (1648-1687). The small castle (Hasbahçe Köşkü) was added with some restoration during the reign of Sultan Ahmed III (1703-1730). It is known that Ahmed III often stayed at this palace. After the treaty of Pozarevac had been signed in 1718, the Republic of Venice presented the Ottoman Sultan with huge and enormous mirrors. The Sultan ordered to install these Venetian poplar (kavak) sized mirrors into a palace. Mirrors were placed to the salon and rooms in the Aynalıkavak Kasır. This is one of the reasons why the palace is called “Aynalıkavak Saray” (the palace with poplar sized mirror). In 1720, the circumcision (sunnet) ceremony of Sultan Ahmed III’s sons was held by Sultan Ahmed III and it lasted for fifteen days and nights. The ceremonial entertainments were held in Okmeydan, and the Sultan and his entourage watched them from the Aynalıkavak Kasır. Later, the palace was abandoned by subsequent sultans and damaged by fire in 1766. A year later, it was repaired by the chief court architect, İbrahim Ağa. In 1779, a new kasır was built next to the old kasır, Mutemedan. In the same year, a treaty between Turkey and Russia was signed here, after which the treaty became known as “Aynalıkavak Act of Amendment”. During the war with Russia, the kasır was used as a public granary. In the end of 18th century, the palace received its final shape during the reign of Sultan Selim III (1789-1807). Selim III appointed Kirkor Balyan to build the Hasbahçe Kasır in its place in 1791. Sultan Selim III was a talented composer. He played tanbur and ney, and wrote his compositions in this palace. After being used for a year, the garden and kasırs were again abandoned. During extension of the Royal Dockyard in 1802-1803, the pavilions of the palace were demolished one by one, and the land annexed to the Imperial Dockyard. The Büyük Hasoda Pavilion was only saved and entirely redecorated. It was used as a residence of the Sultan, his harem and their entourage in spring, when they come to watch the displays of skill on Okmeydanı shooting field. It is known that Kirkor Balyan restored the kasır by order of Sultan Mahmud II (1808-1839). As of today, the Aynalıkavak Palace is opened to the public as a national museum. 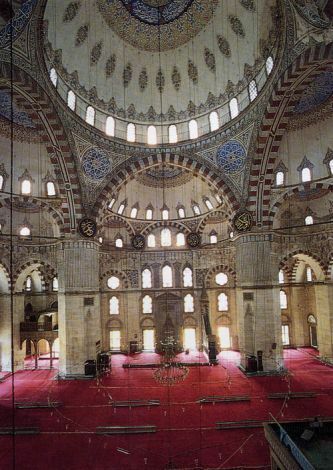 Pars Tuğlacı, The Role of the Balyan Family in Ottoman Architecture. Istanbul: Yeni Çığır Bookstore, 1990. Aynalıkavak Kasrı. Istanbul: TBMM Milli Saraylar Daire Başkanlığı Yayını, 1994. Gül İrepoğlu, Levni, Painting Poetry Color. Istanbul: Republic of Turkey Ministry of Culture, 1999.